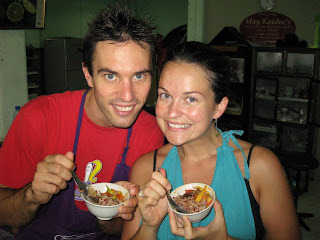 We took a Thai Cooking class on Sunday. 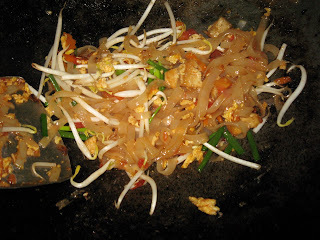 For four hours we made 10 vegetarian Thai dishes. 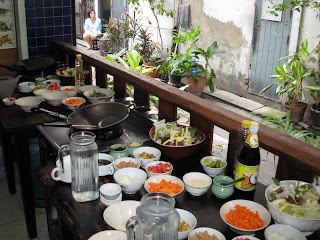 Not promising an authentic Thai banquet when we return, but learned a lot and will practice for the next 9 months. This is just one out of the many reasons why you should come visit us! 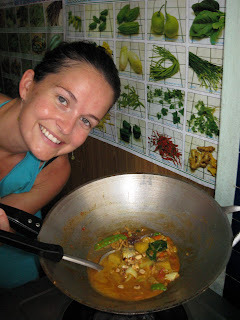 You too could be a Thai cook! We ate a small portion of every dish. Four hours of straight eating filled us up! We wonder how those Thais stay so skinny! Prepping for our next dish, fresh spring rolls and peanut sauce. 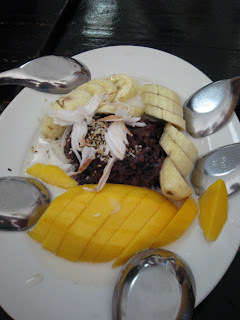 Mango, banana, black sticky rice and coconut milk. I like the picture with David's armpit...awww, we miss you guys already! Please visit when you get back to the states! Hey Dan. 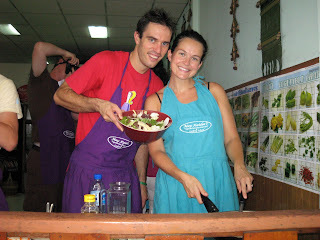 I took a class like this in Vietnam and it was one of the funnest times ever....and SO tasty. Glad you're having a diverse experience out there.